Miniclip’s Fragger has become one of the most popular iPhone applications out there. And for good reason: the game is all about explosions. Though it has a simple interface and an adorable cartoon art style, don’t let that deceive you—the hundreds of physics-based puzzles require careful planning and clever solutions. It's like Angry Birds, except with grenades. You control a "Fragger," a special ops soldier that throws grenades at, or into, various structures in hopes of blowing up masked men caught in the structures’ confines. With your finger, you can adjust the angle of the Fragger’s throwing arm and the speed at which you will throw the grenade. When you release your finger from your screen, you will throw the grenade. Think of Fragger as Angry Birds but more overtly violent. Fragger currently comes with nearly 100 levels to complete. Levels take place in desert, urban and water environments. There is also a set of levels, known as Planet X levels, that take place on another planet. You can play game levels in Normal, Hard or Elite difficulty modes. The vast majority of game missions, regardless of the difficulty setting, are distinct and take a lot of thought to finish. The structures protecting the bad guys are quite different from another. At one point in the game, you have to throw a grenade over the arch of a roller coaster so that the grenade will roll down the arch and blow up the enemy at the bottom of the coaster. 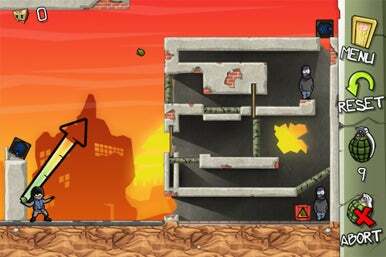 In another level in the game, you have to throw a grenade through a building’s chimney so that the grenade will fall into the building and then blow up a wall protecting an enemy. You then have to throw another grenade through the hole the previous grenade made to make your kill. Most levels require you to blow up multiple assailants. The game makes you think about the order in which you have to dispatch the assailants, because the explosion from one grenade may cause structure rubble to shield another assailant from future grenades. Or, oppositely, blowing up one masked man may make it easier to take out another. In some levels of Fragger, you have to throw a grenade at just the right spot of a building so it will bounce to where you need it to go. Figuring out what spot to throw the grenade at takes a lot of visualization and practice. Thanks to a nuanced and sensitivity physics engine, even if you figure out the appropriate throwing spot, you have to determine the speed and angle appropriate for throwing the grenade—which takes effort. You only get a few tries to get your throw right too, as each level presents you with only a handful of grenades to toss. In my time as a Macworld reviewer, I have rarely played a game that I have just kept wanting to play. In fact, I delayed writing this review as long as I could so I could keep playing Fragger. The game’s levels are incredibly diverse and challenging, and I never got bored playing them. I haven’t found a fault in their functioning either. Now that I have finished the game, I feel slightly saddened, almost at loss of what to do. Luckily however, Miniclip is going to release new levels for the game on a regular basis. The next group of levels, known as Artic Storm, will be out in late November. Due to its simple interface, level diversity, and its strategic element, Fragger is highly addictive and simply one of the best puzzle games for the iPhone.